This miniature was formerly bound at the front of a Commentary on the Rule of St. Benedict, written at Christ Church, Canterbury, c.1170. 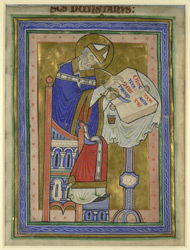 The text was probably copied from a 10th-century manuscript which was corrected and annotated by St. Dunstan, archbishop of Canterbury (d.988), and although he was not the original author, he is depicted in this full-page 'author portrait'. Dunstan is shown with a halo, wearing his full ecclesiastical vestments. He writes in an open book (the semi-circular head- and tail-tabs, typical of 12th-century bindings, are clearly visible), holding the parchment down with his pen-knife. The words he writes are the first words of the Rule of St. Benedict ('Obsculta o filii precepta magistri').